Key difference: Administration frames the objectives and policies of an organization. Management implements these policies and objectives. Management and administration are at times used interchangeably; however, they are two different levels of the organization. The administration is the top level of the organization with the decisive functions. 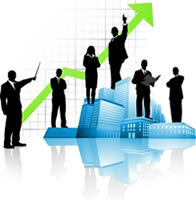 They are responsible for determining the policies and objectives of the organization or the firm. Management, on the other hand is the middle level executive function. They implement the policies and objectives as decided by the administration. The administration includes the people who are either owners or partners of the firm. They usually contribute to the firm’s capital and earn profits or returns on their investment. The main administrative function is handling the business aspects of the firm, such as finance. Other administrative functions usually include planning, organizing, staffing, directing, controlling and budgeting. Administration must integrate leadership and vision, to organize the people and resources, in order to achieve common goals and objectives for the organization. Management usually incorporates the employees of the firm who use their skills for the firm in return for remuneration. Management is responsible for carrying out the strategies of the administration. Motivation is the key factor of a management. Management must motivate and handle the employees. It can be said that management is directly under the control of administration. Art of getting things done through others by directing their efforts towards achievement of pre-determined goals. Formulation of broad objectives, plans & policies. Decisions within the framework set by the administration. Major decisions of an enterprise as a whole. Group of managerial personnel who use their specialized knowledge to fulfill the objectives of an enterprise. Consists of owners who invest capital in and receive profits from an enterprise. Popular with government, military, educational, and religious organizations. Decisions are influenced by the values, opinions, beliefs and decisions of the managers. Influenced by public opinion, government policies, customs etc. Handles the business aspects such as finance. Nice work, well explained, Bravo! I thank you for the elaborate explanation.